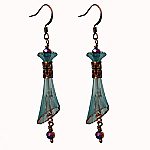 Fun playful earrings with trumpet shape. Easy to make earrings that can be created in less than an hour. Simple wirewrap and chain construction. Instructions come with the kit.